Fly To Hogwarts: 15 Harry Potter Illustrations That Will Take You Back To The Magical World Once Again! See Gabriel Picolo's insanely creative Harry Potter fan art collection. Gabriel Picolo is one of the coolest Harry Potter fans whose artworks will take your breath away. Based in Brazil, working as a freelance illustrator who usually paints and works on nostalgia, constellation and love stories, Picolo has created a special album dedicated to his HP artwork. In here, he’s drawn mini books based on spells, creatures, potions and other amazing Potter world things. And the way he has explored the magical world is like no one has ever before! So here we present some of his brilliant works that will take you towards an impeccable Hogwarts Journey! I just did the Pottermore test and my Patronus turned out to be a beagle! ???? Not my favorite animal so we are still getting along (I really liked how they did the quiz though!). What's your Patronus? "The mind is not a book to be opened at will and examined at leisure." – Severus Snape - #hpspellbooks #throwbackthursday #harrypotter Sorry for the long inactivity guys! I'm posting some wips on my stories but I'm out of time and too tired to finish them ????. I'll be back soon though, thanks for all the kind messages! ???? • Dementors ???? PLEASE READ: if you're among the people requesting this series as prints/books, I'm very sorry but I can't do that. I would love to, but Warner Bros copyright laws are very strict and I don't want any trouble with them. ???? HOWEVER, I will be back to this series later on this year to draw the Fantastic Beasts as I'm super hyped for the new movie! See you soon potterheads ???? #hpspellbooks #fantasticbeasts One last thing: one of the reasons I'm posting this is because I'm slow on replying emails and DMs right now, thanks for understanding! "Get too near them and every good feeling, every happy memory will be sucked out of you" - Dementors ???? 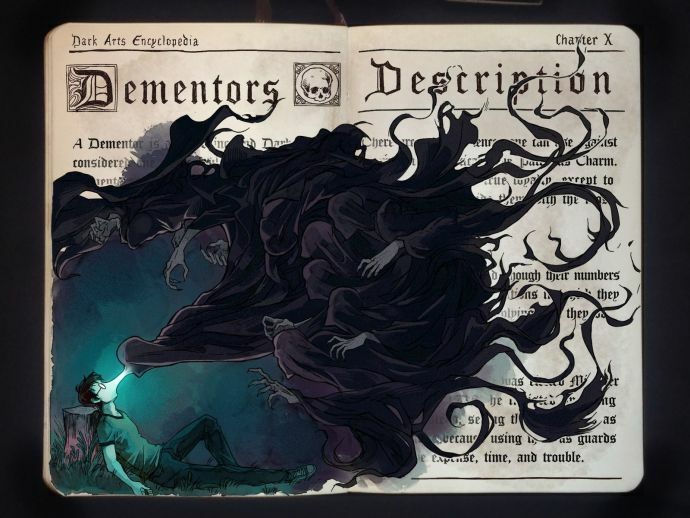 #hpspellbooks #harrypotter #dementor #illustration #doodle #drawing #hpart #dark #macabre Random trivia for you: JK Rowling has revealed that the inspiration for Dementors came from her bout with severe depression before the success of HP. Check out rest of his amazing creations here!